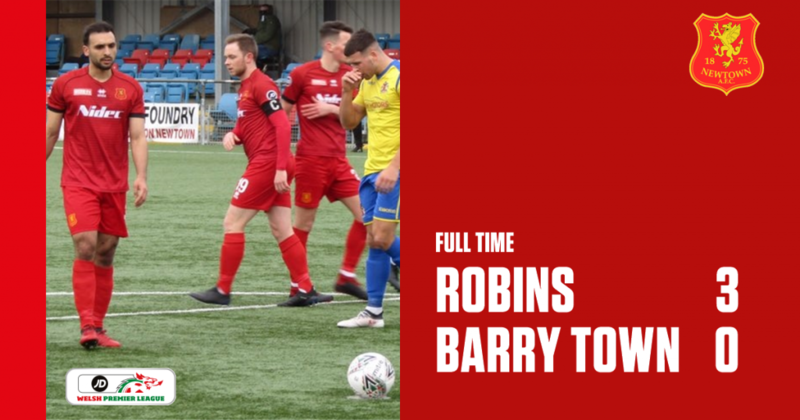 The Robins’ enthralling first half display made it a long trip home for Barry Town United. Newtown’s fantastic form at Latham Park this season continued with a 3-0 win over third place, Barry Town United. Saturday’s win now decreases the gap between Newtown and Barry Town to six points with five league games remaining in the JD Welsh Premier League. 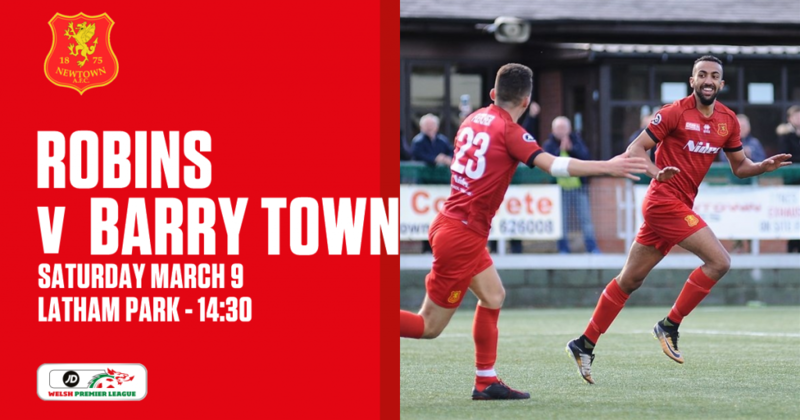 Barry Town may have a game in hand over Newtown but Saturday’s display has now put the pressure on Town in their bid to finish third. Newtown manager Chris Hughes made three changes from the starting line-up away to Bala Town from over two weeks ago. Dave Jones returned in goal after a few weeks out from a head concussion against Connah’s Quay Nomads while Jay Denny and Joe Kenton also made a return. Jack Perry, Steve Leslie and Neil Mitchell started from the bench. Ahead of kick-off, Barry Town were nine points ahead of Newtown in the Welsh Premier League table, the first half display between both sides would challenge the current standings. 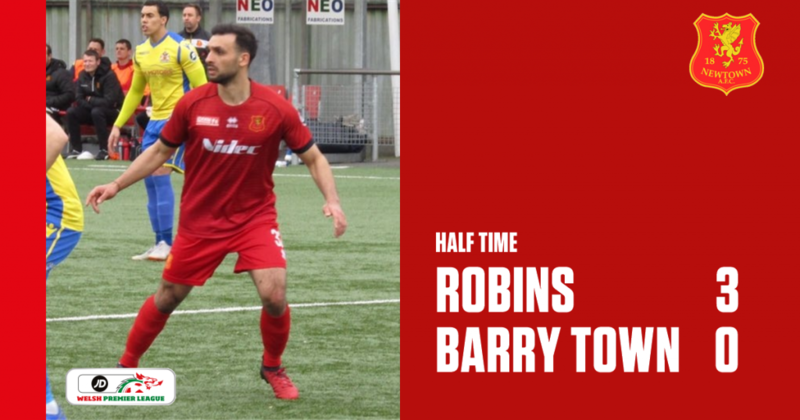 The opening 10 minutes saw an evenly match between the two sides with early bookings for Newtown’s Kieran Mills-Evans and Barry Town’s Jordan Cotterill. It wasn’t until the 16th minute when the match hosted it’s first real opportunity. Porya Ahmadi took a volleyed shot at goal but was saved by Mike Lewis. Nine minutes later however, Ahmadi was given a golden opportunity to open the scoring when a penalty was awarded to the hosts. Joe Kenton went in for the loose ball in Barry’s box moments before he was taken down by the Barry Town goalkeeper. Ahmadi stepped up to the penalty spot and tricked Lewis by going the other way placing the ball into the bottom corner of the net, 1-0 they led. It took 31 minutes for the visitors to make any sign of impact when Drew Fahiya produced a dangerous cross into the box but luckily no yellow jersey was insight. 60 seconds later, Town’s captain Jordan Cotterill made a cutting run across the edge of the box before taking his shot at goal – comfortably stopped by Dave Jones. 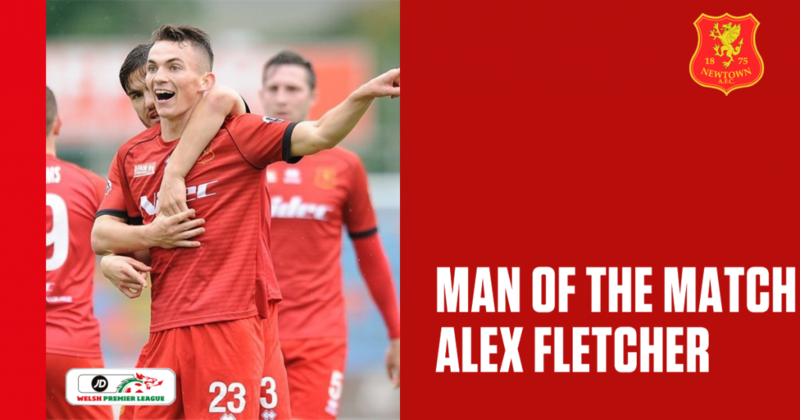 The scoreline started to look good for the hosts when Alex Fletcher finished from close range in United’s box to double the lead, 10 minutes before the interval. It got even worst for the visitors when Fletcher was pulled down in United’s penalty area, Momodou Touray taking the responsibility for the foul and a yellow card was given. Ahmadi was cool and calm yet again by chipping the ball down the middle as Lewis dived to his right. A fine finish from our January signing. After the half time break, not much had changed from either side after their team talks during the cool down. Newtown went looking for their fourth goal of the game when Kenton picked up a decent long ball in United’s box, he then displays a fantastic strike at goal but it was also a fantastic finger tip save from Lewis. The second half would prove to be a close but yet so far period for Kenton. On the 67th minute, the midfielder was close yet again when he ran into the box, beating his man, but the finish saw the ball fly over the target. Just before the match had reached 70 minutes, Mills-Evans had to head the ball off the goal line to keep Jones’ clean sheet hopes alive. 14 minutes from time and Kenton was even closer to the target by rattling the crossbar after converting from a short pass in Barry’s box. It just wasn’t going to be Kenton’s day with 3 minutes left on the clock, he this time hit the post after picking up a magnificent cross from Craig Williams. 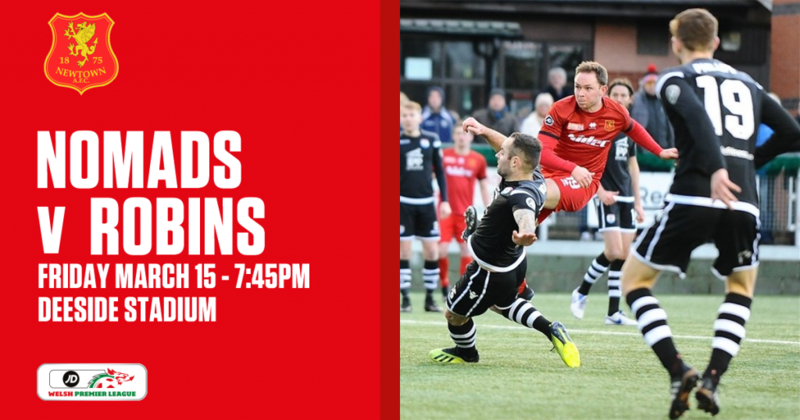 The scoreline stayed at 3-0 at full time in what has been one scintillating statement from the Robins ahead of their trip to Connah’s Quay Nomads this Friday night. Newtown AFC: 1. Dave Jones (GK); 3. Callum Roberts, 5. Kieran Mills-Evans, 6. Jay Denny, 8. Nick Rushton (9. Luke Boundford 88′), 11. Joe Kenton, 18. George Hughes (17. Sam Phillips 88′), 19. T. Craig Williams (C), 23. Alex Fletcher, 26. Sam Barnes, 32. Porya Ahmadi (7. Neil Mitchell 81′). Substitutes: 10. Steve Leslie, 17. Sam Phillips, 7. Neil Mitchell, 9. Luke Boundford, 25. Will Evans, 13. Jack Perry. Goals: 32. Porya Ahmadi 26′ (P), 42′ (P), 23. Alex Fletcher 35′. Yellow cards: 5. Kieran Mills-Evans 11′, 3. Callum Roberts 29′, 23. Alex Fletcher 48′. Barry Town United: 1. Mike Lewis (GK); 5. Curtis Watkins, 4. Luke Cooper, 3. Chris Hugh, 11. Drew Fahiya, 6. Robbie Patten, 29. Clayton Green, 10. Jordan Cotterill (C) (20. Sam Snaith 71′), 9. Momodou Touray (18. Rhys Abbruzzese 71′), 7. Kayne McLaggon, 8. Troy Greening. Substitutes: 2. Paul Morgan, 16. Jonathan Hood, 42. (GK), 26. Lewis Cosslett, 18. Rhys Abbruzzese, 14. Evan Press, 20. Sam Snaith. Yellow cards: 10. Jordan Cotterill 11′, 11. Drew Fahiya 28′, 9. Momodou Touray 41′.